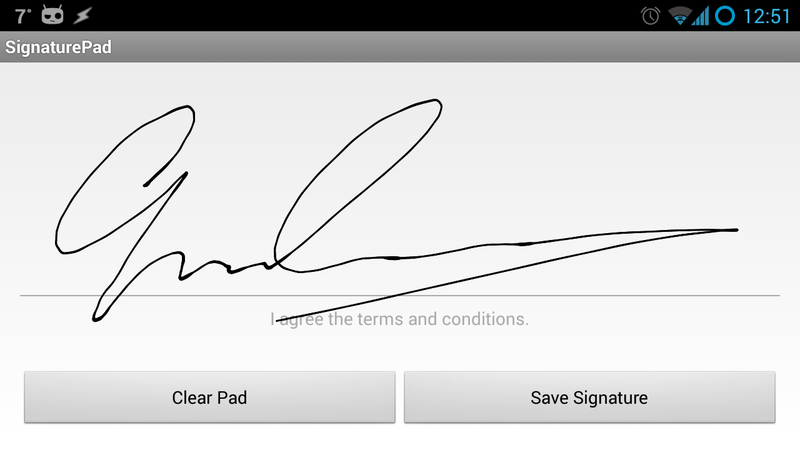 Android Signature Pad is an Android library for drawing smooth signatures. It uses variable width Bézier curve interpolation based on Smoother Signatures post by Square. Latest version of the library can be found on Maven Central. Please see the /SignaturePad-Example app for a more detailed code example of how to use the library. Add the SignaturePad view to the layout you want to show. penMinWidth - The minimum width of the stroke (default: 3dp). penMaxWidth - The maximum width of the stroke (default: 7dp). penColor - The color of the stroke (default: Color.BLACK). velocityFilterWeight - Weight used to modify new velocity based on the previous velocity (default: 0.9). getSignatureBitmap() - A signature bitmap with a white background. getTransparentSignatureBitmap() - A signature bitmap with a transparent background. getSignatureSvg() - A signature Scalable Vector Graphics document. Thanks to netinhoteixeira, there is a Cordova plugin using that library. Please refer to https://github.com/netinhoteixeira/cordova-plugin-signature-view. Thanks to bradmartin, there is a NativeScript plugin. Please refer to https://github.com/bradmartin/nativescript-signaturepad. Currently doesn't support screen rotations. Pull requests are welcome!